The #StartingGood Virtual Summit is a free-to-access 11 day virtual summit that brings together 30+ world renowned social entrepreneurs, changemakers, and innovation leaders to talk about creating a lasting positive impact in the world. At StartSomeGood, we’re convinced that we are entering the Era of Purpose. We see this all around us. In the demands from graduates for meaningful work, from consumers for quality ethical products and from investors for companies that combine profit and purpose. 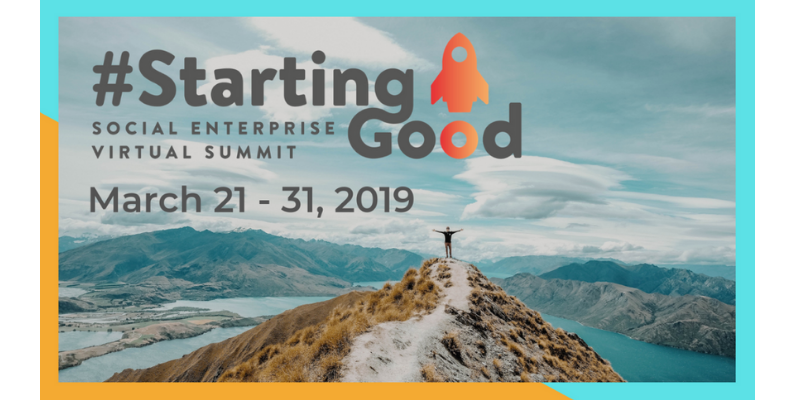 2019 is our third year running the #StartingGood Summit and we are thrilled to be bringing you a stellar line up of over 30 changemakers, innovators, movers and shakers in who are making the world a better place. Previous Summit guests include Nobel Peace Prize winner, Muhammad Yunus, Clay Shirky, Founder of Donor's Choose, Charles Best and Co-Founder of Charity Water, Scott Harrison. 1. INSPIRATION - Seasoned changemakers share their stories on the journey of entrepreneurship revealing their biggest learnings on their path to creating tangible social change. 2. INSIGHTS - Experts open the lid on specific topics like climate change, blockchain, ethical fashion and impact investment. 3. MINDSET - Here we explore the ways in which effective leaders keep their head in the game, maintain their energy and focus, and avoid burnout. 4. ACTION - These sessions are highly practical how-to workshops on the work of entrepreneurship including PR and marketing; recruitment and team culture; fundraising and financial management. Aspiring changemakers with a passion to change the world. #StartingGood will give you the foundation to do so - with knowledge, advice and practical tips to get you started. Innovative thinkers, full of wild ideas, ready to solve the world's toughest problems. #StartingGood will help you turn those ideas into a reality, and shape them into a sustainable social enterprise. Experienced entrepreneurs who want to incorporate more "purpose" in to their work. #StartingGood will provide opportunities for you to learn more about how profit and purpose can work together.